Judy Melinek is a forensic pathologist and an associate clinical professor at UCSF Medical Center. She earned her college degree from Harvard and received her medical degree and pathology residency training at UCLA. She has worked and lived in San Francisco with her husband, T.J. Mitchell, and their children since 2004. T.J. Mitchell graduated with an English degree from Harvard and worked in the film industry before becoming a full-time stay-at-home dad in 2000. 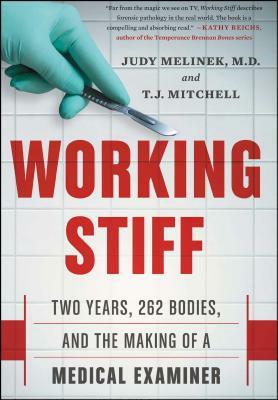 "Fascinating case studies and a refreshing irreverence toward death and autopsies make Working Stiff a funny and engrossing read." — Sandeep Jauhar, author of "Intern: A Doctor's Initiation" and "Doctored: The Disillusionment of an American Physician"
“Working Stiff is an engrossing and revealing glimpse into the making of a medical examiner with a searing insider's view into working at the New York Medical Examiner's Office during and just after 9/11. The story of how the author dealt with her father's suicide during childhood and later had to deal with suicides as part of her duties is wrenching and compelling." — Jan Garavaglia, M.D. (Dr. G from the Discovery Channel Series and author of "How Not to Die"
"A riveting read, at once compassionate and morbidly fascinating." — Todd Harra, author of "Over Our Dead Bodies"
"Working Stiff is an eye-opening, gripping account of the life of a forensic pathologist working in New York City. Whether dealing with routine autopsies, surviving relatives, or the catastrophe of September 11, Dr. Judy Melinek reveals the dignity of being human in the face of death." — Leora Tanenbaum, author of "Taking Back God"
"In this engrossing tale of how Melinek became a forensic pathologist, she pulls back the sheet to show readers just what goes on after someone dies... Armchair detectives and would-be forensic pathologists will find Melinek’s well-written account to be inspiring and engaging." "Both chilling and heart-warming at the same time, Judy Melinek's account explains how empathy and humanity are as important working with the dead as they are with the living. She strikes the balance just right in helping us better understand what we most fear, yet still fear it all the same." "Melinek’s enthusiasm for her calling is always apparent, and her writing is un–self-consciously bouncy, absorbed and mordant (though not caustic).... A transfixing account of death, from the mundane to the oddly hair-raising." Working Stiff is the grossest book you'll ever love. But it is also so much more than that: Seamlessly fusing memoir, science journalism, riveting whodunit mysteries, and light humor about a dark topic, Working Stiff is a relentlessly fascinating and informative book from the first page to the last. Judy Melinek--whether she's re-enacting assaults in a courtroom while heavily pregnant, or fighting with lazy homicide detectives, or solving amazing forensic mysteries through the ghastly things she does with her corpses--is an unfailingly charming and even inspiring guide to the world of medical examiners. A remarkable achievement by Mitchell and Melinek. — Scott Stossel, editor of The Atlantic magazine, and author of the New York Times Bestseller "My Age of Anxiety"
"Spellbinding. . . . Melinek is movingly empathetic toward the families of victims. . . . An unforgettable story." "Melinek chronicles her time at the city’s Office of the Chief Medical Examiner — and it’s nothing like what you see on television." "Working Stiff is an account of Melinek's years in training, complete with gory details, heartfelt emotions and plenty of ripped-from-the-headlines case studies. This mixture of nonfiction and narrative makes for compelling, informative reading as Melinek works through cases of homicide, accidental death, medical error and suicide--and becomes even more powerful as the authors recount the harrowing weeks and months following the 9/11 World Trade Center attacks, which brought more bodies and death to Melinek's door than ever before." "Haunting and illuminating...the stories from [Dr. Melinek's] average workdays should also transfix the reader with their demonstration that medical science can diagnose and console long after the heartbeat stops." "[Melinek's] true, frank and often funny account, written with her husband TJ Mitchell, reveals how as a young forensic pathologist her “rookie season” brought some incredibly harrowing deaths that would have rocked a less strong personality to the core in the Big Apple."